I made another tool order last night. This time from Avery. I’ve heard really good things about them, but they tend to be more expensive for some things. Merry Christmas to me (and all of you…). POP RIVET DIMPLERS – 3/32″ – These dimple dies are for hard to reach places in the aft end of ribs. You can also use them on the skins, if you don’t really want to buy a c-frame, (or are planning on borrowing one, and haven’t gotten around to it.) I know a few people on the forums who have done all of their skins with pop-rivet dies. I definitely need them for the ribs, so if they work out, I’ll try them on the skins. Otherwise, I’ll get the c-frame. 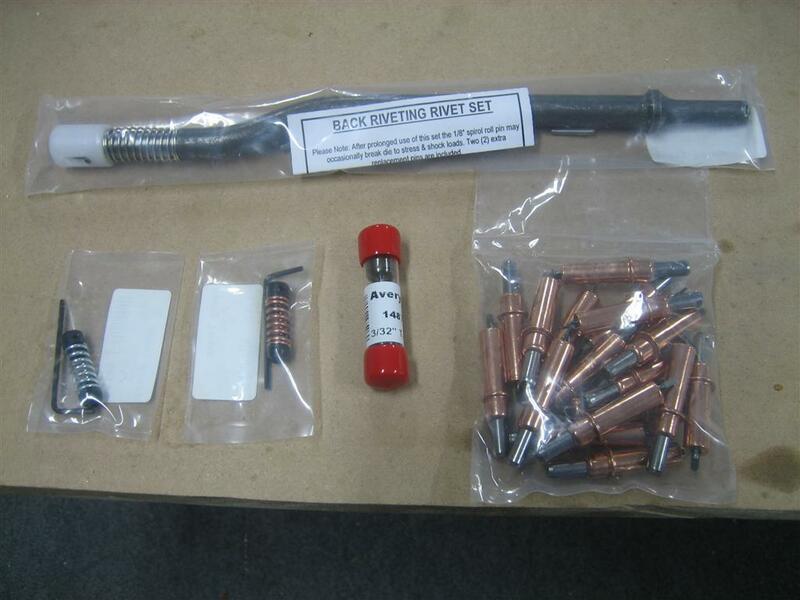 3/32″ TANK DIES – This is for dimpling the understructure (ribs, etc.) with a slightly larger dimple (dies were made for dimpling the fuel tanks, where the pro-seal required to seal the tanks prevents the rivet head from sitting flush). I’ve decided, after reading Brad Oliver’s post on the tank dies here, and then confirming that many builders have gone this route, that this will be a good idea. EXTRA LONG DOUBLE OFFSET BACK RIVET SET – I need a backrivet set anyway, so instead of ordering the cheap (pronounced “great value”) one from the Yard, I decided to just get one…one that will work when I need to backrivet something (in the wings?) with a double offset. People rave about backriveting the wing skins, and while I am a long way from those steps, at least now I’ll only need one backrivet set instead of two. DRILL STOPS – #40 Drill Stop – I tried to make my own drill stops out of tubing, but it didn’t work. I hope these are nice. DRILL STOPS – #30 Drill Stop – Needed the #30 size, too. MONOGRAM AIRCRAFT SHEET METAL FASTENERS (CLECOS) – 1/8″ CLECO – Ha. I bought 18 of these to bring my subtotal to $100.02. Free shipping over $100! I’m so clever. Avery tool order that came in. Wuhoo! Apparently I had already put away the pop rivet dimplers. Sorry. They come in a little plastic baggy about the size of the drill stop bags with about 6 extra nails in it. This entry was posted on Friday, December 25th, 2009 at 10:13 pm and is filed under Builder's Log, Tools. You can follow any responses to this entry through the RSS 2.0 feed. You can leave a response, or trackback from your own site.